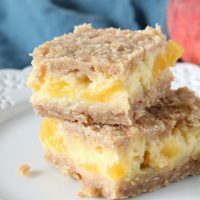 Simple Peaches and Cream Bars with fresh peaches, creamy custard and a brown sugar crumb crust. 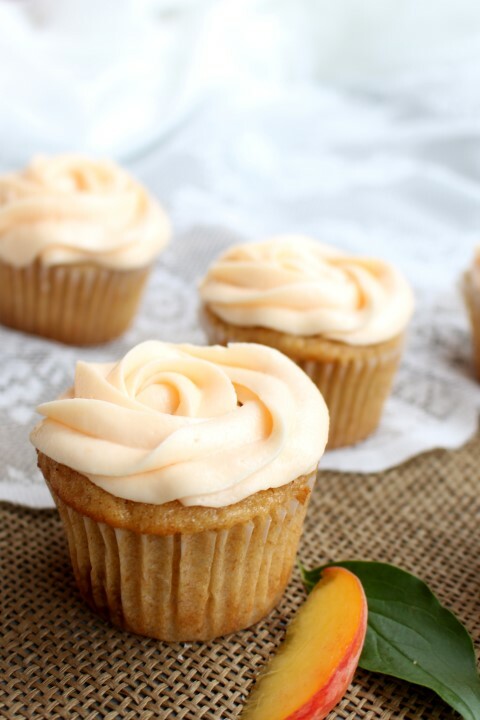 So I’m holding onto summer a bit longer and posting another peach recipe, even though the local grocery store is bringing out the apple baked goods and selling cinnamon pine cones already!! I’ve made these peach bars several times this summer and only recently was able to to snaps some pictures of them before we ate them. 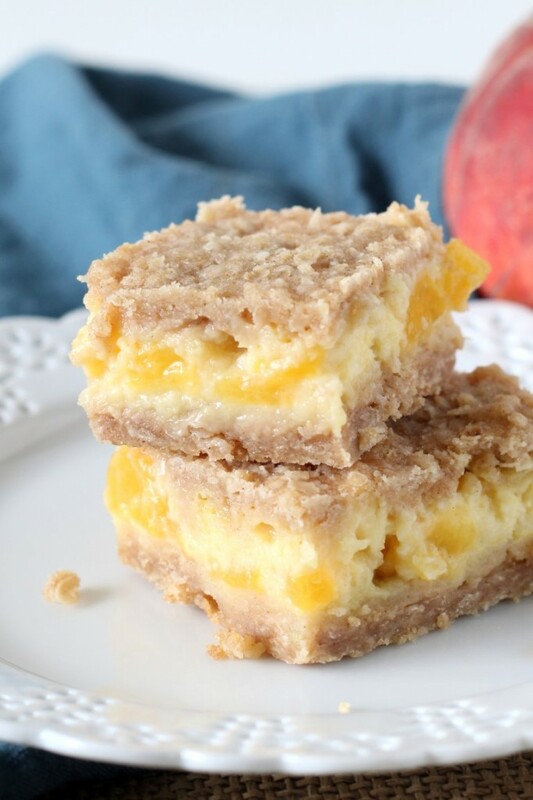 If you like custard peach pie, you will love these bars. They have all the delicious custard in the middle, only they are easier and quicker than peach pie to make. The brown sugar crumb crust is is also addicting just by itself. Before peach season ends, I’m also eyeing this Fresh Blueberry Peach Cake and these Baked Peaches and Cream. 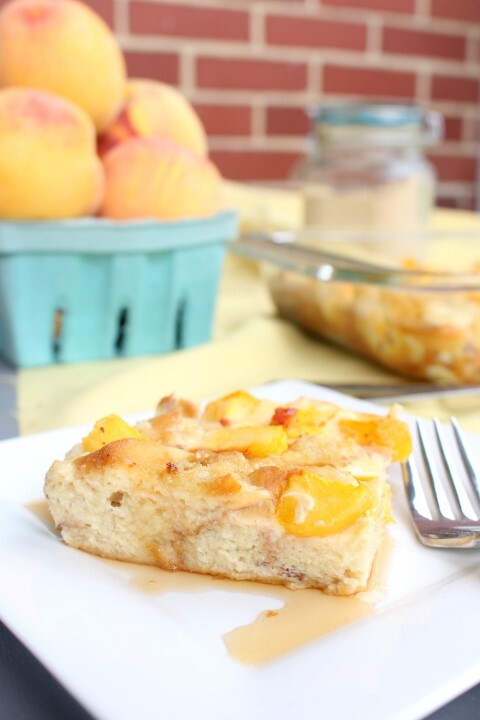 What are your favorite things to make with peaches? 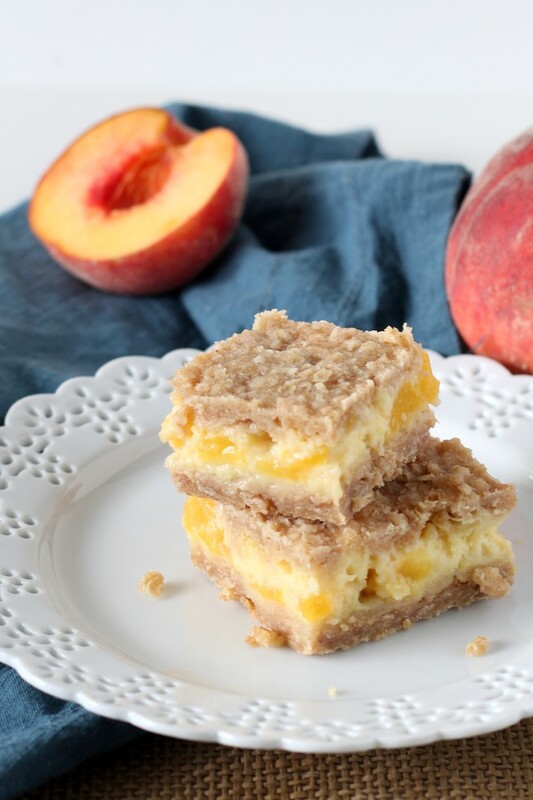 Simple Peaches and Cream Bars with fresh peaches, creamy custard and a brown sugar crumb crust. Preheat the oven to 350 F. In a medium mixing bowl, combine the flour, oats, brown sugar, cinnamon, nutmeg. Cut in the butter with a pastry blender until pea sized crumbs are formed. Reserve 2 cups of the crumb mixture for the topping and press the remainder into a greased 9 x 13 inch baking pan. Bake for 10 minutes in a preheated oven. Meanwhile, cream together the sugar and cream cheese until smooth, beat in the eggs, milk, flour, vanilla and salt. Gently stir in the peaches. Remove the crust from the oven and gently pour the peach filling onto the crust. Top with the remaining crumb mixture. Bake for 32-35 minutes or until filling is set. SSSSSSSSSSOOOOOOOO much deliciousness in these bars! I simply LOVE that peach filling! And that brown sugar crumb crust – swoon!